The Department of Science and Humanities was initiated in the year 2000. It comprises of varies disciplines like Mathematics, Physics, Chemistry and English. Since Science is the basis for all Engineering disciplines, the courses offered by the department form the foundation of all Engineering courses. The highlight of the Department is the Bridge Course offered for the new entrants of the college to enable them to cope with the higher education system. To expose the students to the latest trends in the relevant subjects, the department organizes a series of guest lecturers every academic year. In keeping abreast with the latest demands of the placements, the department strives to impart various skills like communication skills, technical skills, soft skills and Essential Life Skills to the young aspirants of the institution. Above all, a holistic development of the students is the major focus of the department for which the members of the staff are easily accessible to their wards for personal guidance and counseling. Science Quiz, Science Model Exhibition, Quiz in Mathematics and celebrating Science Day are the salient features of the department providing platform to showcase their innate talents and innovative ideas. Students take part active part in Science Day celebration and present models and papers. The prime objective of the department is to render quality based education in different perspectives with sound techniques adopting richness in the study of mathematics, science and language that helps the students to understand the modern technology with clarity.Besides academic curriculum,the department aim to develop the personality of students by inculcating human ethical values. To provide students with an intellectually stimulating,challenging and supportive learning environment,which enables them to develop more about their academic and professional skills and make them gain valuable experiences in fundamental courses like mathematics,science and languageand to shape them as future technically skilled professionals. PEO1:To inculcate professional and ethical attitude,effective communication skills,teamwork skills,multidisciplinary approach in the students. PEO2:To produce graduates who have strong foundation in principles of Mathematics, Natural sciences and basic engineering sciences. 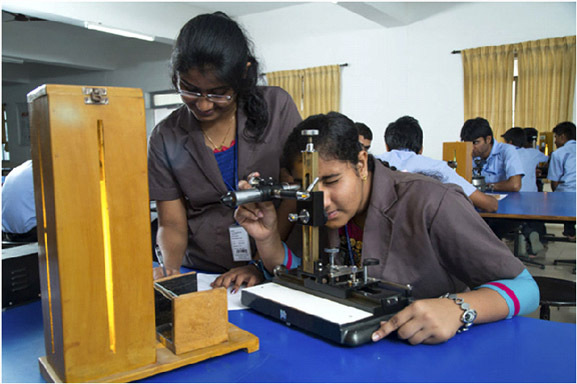 PEO3:To train students across the spectrum of basic and applied science. PSO 1: To develop the ability among students to understand the concept of core science subjects that will facilitate understanding of new technology. PSO 2: To apply critical thinking and analytical skills to interpret scientific data and mathematical models. 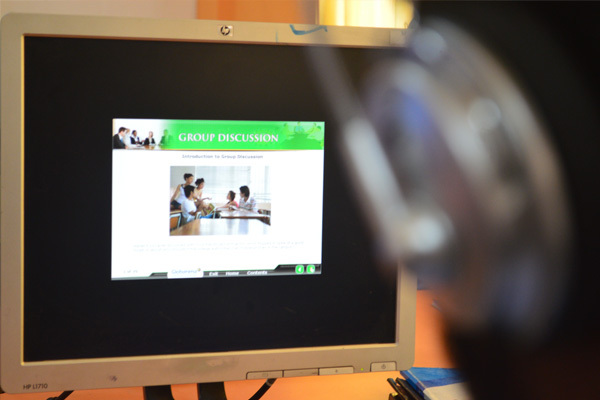 PSO 2: To train the students to communicate effectively in both verbal and written forms. 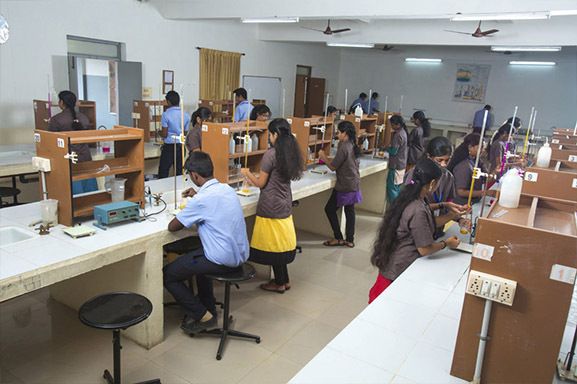 The Physics Laboratory is the basic science lab which is common for all branches of first year with facilities for the group of 30 students to carry out experiments independently. 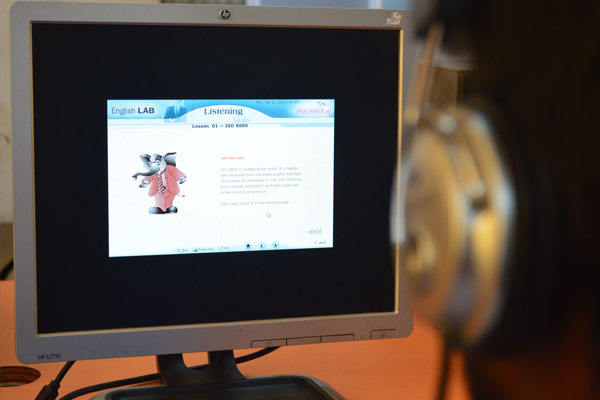 The lab is well-equipped and enables students to understand the fundamentals of Engineering Physics. The Physics Laboratory which is equipped with the latest instruments occupies an area of 252 sq.m. The Chemistry Laboratory is aesthetically designed with polished ceramics tiles, separate balance room and chemical store room. It provides students with a practical approach towards the various techniques used in engineering application. 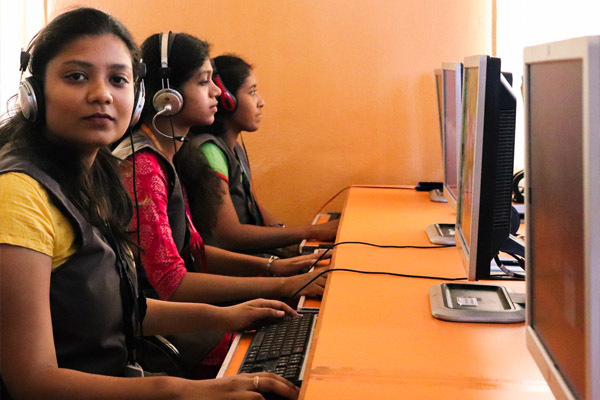 Practical awareness is inculcated and students are trained both quantitatively and qualitatively during the lab sessions so that their understanding and problem solving abilities can be enhanced. Understanding the importance of English language in the higher education system, the department maintains a well-equipped laboratory. The Laboratory syllabus is so designed as a skill based curriculum with a global perspective by the University. 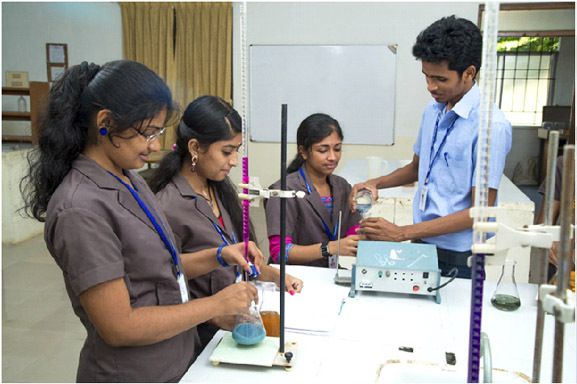 This Laboratory aims at honing the communicative, social, interpersonal and professional skills of the students to enable them to emerge as employable engineers and good competitors in the corporate world. Business Preliminary (BEC Preliminary), is one of our Cambridge English Qualifications. It helps you to get the practical language skills you need to start doing business in English. He has 35 years of teaching experience and working in this institution from 2012 onwards. He has published research articles in 6 International and in national journal. He was member in Board of studies of Bharathiar university and was also member of Board of studies of PSG college of Arts and Science. He is a life member in ISTAM. She received Ph.D. degree in Quality Control from Karpagam University in July2015. She was a Guest Lecturer in the Departmentof Mathematics at Government Arts College Udumalpet from August 1999 to MAR2001. She has more than 15 years of teaching experience in various institutions and she has been working in this institution for the past 10 years. She was a University first rank holder in both under graduation and post-graduation from Bharathiar university. She has published more thaneight papers in refereed journals and published a Paper in Scopusindexed journal. She has presented four papers in National conferences and International conference. She is having 13 years of experience in the field of teaching. She has been working in this institution for the past 10 years. She obtained her Ph.D degree in 2017. She has published nine papers in international journal. She has presented four papers in both National and international 4conferences. She is also a member of IAENG. She is working as an Assistant Professor of Mathematics in this Institution Since July 2013. She has completed her UG and PG from Nirmala College for Women, Coimbatore. She has completed her M.Phil Research work in the area of Specialization, Operations Research from Bharathiar University, Coimbatore and has published five papers in reputed International Journals. At present she is pursuing her P.hD research work in the area of Operations Research in Bharathiar University, Coimbatore. She is an Assistant Professor in Mathematics in the Science And Humanites Department since 2014. She did M.Phil (Mathematics) Degree and Master's Degree in Bharathiar University. She is working as an Assistant Professor of Mathematics in this Institution since 2014. She has completed her Master’s degree in Government Arts and M.Phil in Bharathiar University, Coimbatore. She is working as an Assistant Professor of Mathematics in this Institution since 2014. She has completed her Master’s degree in PSG College and M.Phil in Bharathiar University, Coimbatore. He is working as an Assistant Professor of Mathematics in this Institution since 2014. She has completed her Master’s degree in Government Arts and M.Phil in Bharathiar University, Coimbatore. He is working as an Assistant Professor of Mathematics from July 2015 onwards. He had obtained his UG, PG and M. Phil., degree from N.G.M. College, Pollachi. He is pursuing his Ph.D. Research work in the area of closure spaces at Bharathiar University, Coimbatore and published 2 papers in reputed peer-reviewed National and International Journals. He had participatedin many seminars and conferences at national and international level. He is also a member of American Mathematical Society (AMS) and AMTI. He is qualified in SET (State Eligibility Test) examination in the year 2016. She is working as an Assistant Professor of Mathematics in this Institution since July 2016. She has completed her Master’s degree and M.Phil in Bharathiar University, Coimbatore. She is working as an Assistant Professor of Mathematics in this Institution since 2016. She has completed her UG, PG and M.Phil degree in Bharathidasan University. She has 15 years of teaching experience. She is working as an Assistant Professor of Mathematics in this Institution since 2017. She has completed her Master’s degree in Government Arts and M.Phil in Bharathiar University, Coimbatore. He is working as an Assistant Professor of Mathematics. He completed his B.Sc & M.Sc (Mathematics) from Government Arts college, Salem and M.Phil from Jammal Mohamed College, Trichy. He also pursuing his Ph.D Research in the area of “Stability Issues of Fuzzy System” from Anna University, Chennai. He is working as an Assistant Professor of Mathematics in this Institution. He completed his UG, PG and MPHIL degree in NGM College,Pollachi. His area of specialization is TOPOLOGY. He Published 2 papers in Ideal topological spaces and one Paper presented in the title is “Sg-closed sets in Ideal topological spaces”. She is an Associate Professor (Chemistry) in the Department of Science & Humanities since 2007.She obtained her M.Phil degree from Bharathiar University. She has over a decade of experience in teaching and her areas of specialization includes corrosion science and analytical techniques.She is a Life member in American Chemical Society. He is an Assistant Professor in Chemistry in the Departmentof Science and Humanities since 2010. He has an experience in teaching for 10 years and research for 3 years. He has published 6 papers in peer reviewed international journal and more than 5 paper in national and international conferences. He is a life member in American Chemical Society. His area of specialization includes synthesis organic chemistry and solid state chemistry. He is an Assistant Professor in Chemistry in the Departmentof Science and Humanities since 2017. He has completed his Ph.D degree in She Ramakrishna Mission Vidyalaya. He published 10 papers in international journals with good impact factor. He got best presentation award in international conference. She is Ms.R.Kalaivani completed Msc, Mphil in chemistry. She did under graduate degree in government arts college ooty by secured the marks with first class. She did master degree in P.S.G.R krishnammal college for women by secured the marks first class with distinction, and also did Mphil chemistry in karpagam university by secured the commend highly commended in the field of organic chemistry. She have been working as a assistant professor in karpagam university, and gave five times 100% result in various departments by handling the subject environmental science and engg. chemistry. She have been as one of the co-ordinator for paper presentation, work shop etc. She have 8 years of experience in engg. discipline. He is working as a Professor of Physics at Hindusthan Institute of Technology, Coimbatore. He obtained his BSc, MSc and M.Phil degrees in Physics from NGM College, Pollachi. Ph.Din Physics from Anna University, Chennai.During his PhD, his work specifically facused on Thin films Dye sensitized Solar cells. He has published 4 research papers in reputed international journals and he attended 2National and 2 International conferences. His research interests include Defect Solid State physics, Thin films, Quantum Mechanics and Nano materials. He has eighteen years of teaching experience. She is working as associate professor of Physics from march 2014 onwards. She obtained Ph.d degree from Bharathiar University in the year 2014. She has published 7 international journals. She is working as assistant professor of Physics from march 2018 onwards.She had worked as an assistant professor in department of physics at Kathir college of engineering from March 2013- May 2014. She has published two papers in international scientific journal and international conference on “Lithium ion battery”. He is working as Assistant Professor of Physics at Hindusthan Institute of Technology, Coimbatore. He obtained his BSc and MSc degrees in Physics from NGM College, Pollachi. M.Phil in Physics from Bharathidasan University, Tricy and Ph.D in Physics from Alagappa University, Karaikudi. During his PhD, his work specifically facused on cathode materials for rechargeable lithium batteries and he attended Summer Internship Programme for Indian Students at Department of Physics, National University of Singapore, Singapore. He has published 7 research papers in reputed international journals and he attended 20 National and 7 International conferences. He got two seminar funding grant from CSIR and ICMR. His research interests include Solid State Ionics, Thin film and Nano materials. He has five years of teaching experience. He is a life member of International Association of Engineers and International Society for Research and Development. She is working as Assistant Professor of Physics in the Department of Science & Humanities. She obtained her UG in PSGR Krishnammal College for women and PG degree in NGM ,M.Phil in PSG college of Arts and Science. Currently she submitted her thesis.She has published 4 research papers in reputed international journals and she attended 1 national and 4 international conferences. She has 7 years of teaching experience. She is working in this Institution for the past four years. She completed her M.Phil from Periyar University in the year 2008 and PG from Annamalai University in the year 1996. She is working in this Institution for the past two years. She has a total experience of seven years from both Arts & Science College and Engineering Colleges. She completed her UG from NGM College of Arts & Science, Pollachi in the year 2008 and PG from Bharathiyar University in the year 2010. She has done her M.Phil in Postcolonial Literature from NGM College, Pollachi under the guidance of Prof. M. Muthukumaravel, HOD - NGM College, Pollachi. She has also secured Business English Certificate – Vantage given by Cambridge English. She has published an article “The Emergence of Magical Realism” in an International Journal, LITERARIA. She is working as an assistant professor in English in this institution from August 2016 onwards. She had obtained her PG & M.phil Degree from Madurai Kamaraj University and UG from Alagappa Arts College, Karaikudi.She is having more than ten years of experience in the field of teaching at various institutions. She had participated in many seminars and conference at national level and presented papers on ELT (English Language Teaching). She is working as Assistant Professor of English in this institution since October 2016. She is pursuing her Ph.d in African Literatute at Bharathiar University. She has an experience of 10 years in teaching from various institutions. She has published two papers in international journal and has presented about 5 papers in both National and international conferences. She has an experience of 8 years in teaching from various institutions. She has published one paper in ISBN and has presented about 2 papers in both National and international conferences & Seminar.